Photo: Los Angeles World Airports. 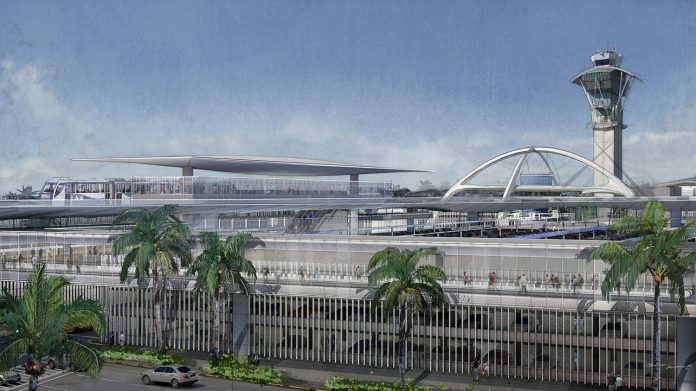 A consortium led by ACS Group/Hochtief has been chosen as the ‘recommended developer’ for a €1.57 billion public-private partnership (PPP) rail project at Los Angeles International airport. The project includes planning, financing, construction, and 25-year operation of an automated people mover, which will have six stops connecting new parking facilities and metro light rail stations with the airport’s terminals. Other partners in the consortium include: Dragados USA, Flatiron Construction, Fluor and Balfour Beatty. The project also includes the delivery of 44 automated people movers from fellow consortium member Bombardier. Located 15-20m above the ground, the 3.6km-long line will improve passenger access to the terminals of the second largest airport in the USA. Hochtief said that it anticipates commercial and financial close will take place in April and June, respectively, with construction of the project estimated to be complete in early 2023. Spanish construction firm ACS Group owns a 50 per cent stake in German construction company Hochtief. Flatiron Construction is a subsidiary of Hochtief and Dragados USA is a subsidiary of ACS Group.